Fully rigged at the marina, we begin backing down to the ramp. We took over an hour to rig her but will be faster with practice. The good news was that we remembered all the various pieces that we needed. 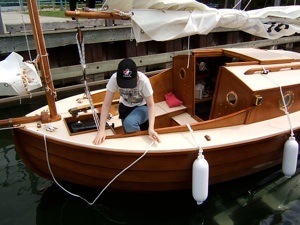 The crew reports dry bilges and no obvious intrusion of water. The pumps remain quiet. That is a good thing. 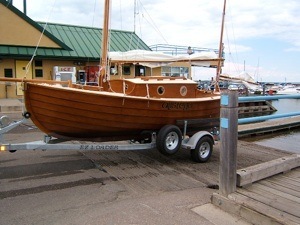 She’s freed from the trailer and prepared to leave the marina. Motoring out with the crew at their stations, watching for those pesky powerboats. The weather was poor enough that the Sea-Doo or Jet Ski types were not out. Some of the dark sky can be seen here. 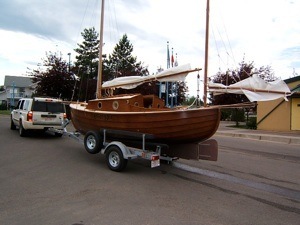 The temporary fore stay is handy for that time between raising the mast and fitting the bowsprit and tensioning the bob stay after coming off the trailer. 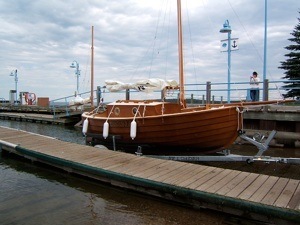 The mizzen goes up in earnest for the first time. Yes, that is a sail maker’s tag that was left on by mistake. Doesn’t make much of a wind indictor, unfortunately. 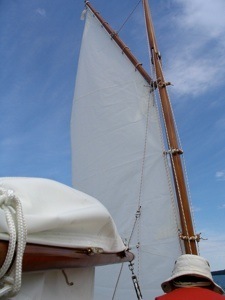 With the mizzen sheeted in, the boat will sit head to the wind all day, no problem. 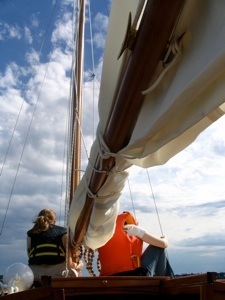 With the hull sitting quietly to the wind, the jib goes up, immediately catches the wind, turns the bow off a bit and we’re sailing. The poor weather closes in even more. 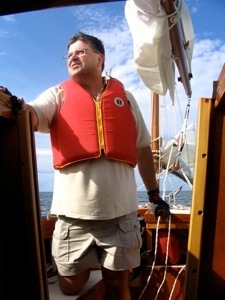 Here I am at the helm, not quite sure that I can believe we’re actually sailing Alistego, at last. I don’t like many pictures of myself in the first place, but I need a PFD that does not make me look like a monkey in a vest. 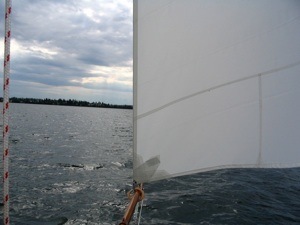 The boat felt solid under sail in really gusty conditions that had us sitting still one second and hauling along with the bilge boards humming loudly the next. Time was short with the weather getting worse so we left the main lashed to the boom for this day. 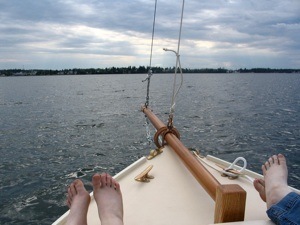 Sailing home after a short but satisfying trial of the boat. The crew keeps watch for traffic as we approach the marina. 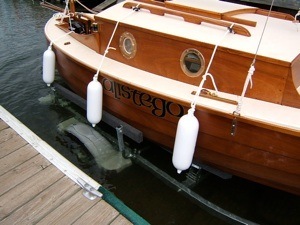 By the way, the whole family loves the boat too. 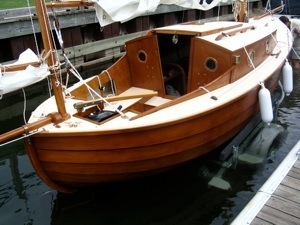 We found her to be stable, predictable, responsive to the tiller, and with a very, very nice ride as a bonus.